WHAT CONSTITUTES A ‘GOOD’ DEAL IN THIS MARKET? 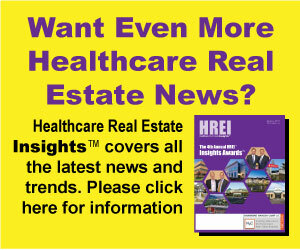 shared their perspectives on current issues in healthcare real estate. In this difficult economy, deal-hungry healthcare real estate developers and investors might be tempted to consider just about any opportunity that comes down the pike. But that makes it all the more important for them to remain objective and disciplined, and to temper their yearning to do deals with a dispassionate analysis of the specific opportunities at hand. That was one of the recommendations of a wide-ranging panel discussion during the recent InterFace Medical Office conference in Chicago. In a session titled “The InterFace Big Picture: The State of the Healthcare Real Estate and Medical Office Market,” a healthcare developer, broker, investor and provider shared their perspectives on the sector. As publisher and founding editor of Healthcare Real Estate Insights™, I was invited to moderate the panel. Gina Weldy, Director of Finance & Real Estate, Northwestern Memorial Hospital. The conference was held April 28, attracting an audience of nearly 170 healthcare real estate professionals and hospital and health system executives to the Standard Club in downtown Chicago.